Veterans that live in the sunshine state of Florida can use the VA mortgage for a home purchase or refinance. The Florida VA loan program backed by Veterans Affairs is a benefit offered to men and women that served our great country. For many reasons, the VA loan in Florida has been an important benefit for Veterans buying a home and starting a family. VA mortgage does not ask qualifying borrowers to make a down payment. 100% of the sales price can be financed. With no down payment requirement and no private mortgage insurance, the Florida VA mortgage is an affordable way for veterans to buy a home with little out of pocket expense. Who is Eligible for the Florida VA Loan? Specific time period – Veterans that served between the dates of September 7, 1980 and August 1, 1990 must show that they were enlisted for at least 24 months in a row. They must be dishonorably discharged as well. Based on these rules, a wide range of military personnel can meet the eligibility requirements for the VA home loan. As a way to honor the memory of veterans that perished in the line of duty, the VA home loan is now available to their surviving spouses. If the veteran was discharged due to injury/disability and subsequently passes away because of the injury, the veteran’s surviving spouse can be eligible for the VA mortgage as well. The VA rules state that the veteran must intend to live in the home as their primary residence. For those of you looking to secure an investment property with a VA mortgage, you will have to owner-occupy one unit and then you can rent out the rest. Available for 2-4 unit properties. It was mentioned earlier that the VA home loan will allow eligible veterans to buy a home with no down payment and also waive the requirement for private mortgage insurance. In order to guarantee the loans for approved lenders, the VA needs available funds to cover an existing mortgage if the payments are not made and the home is foreclosed. These funds come from the VA funding fee. When a veteran uses the VA mortgage for the first time, a fee of 2.15% will be applied. This fee is added to the loan amount, allowing the veteran to pay the fee over time. If a veteran uses a VA mortgage a second or subsequent time, the funding fee will go up to 3.3%. The earlier percentages apply to people that served in the regular military. Members of the National Guard or reserves pay slightly higher fees. The first use is 2.4% and 3.3% for the 2nd and future uses. 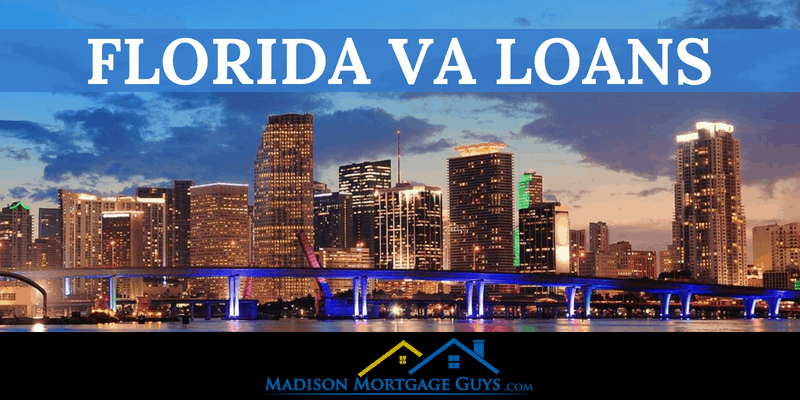 Besides the military service and credit requirements, the other important qualification for the Florida VA mortgage is the debt to income calculation. The lender will calculate the borrower’s monthly debt requirements from their credit report. Added to that amount will be the proposed mortgage payment, including escrow for home insurance and property taxes. The rules state that the calculation should be 41% or lower. For example, a veteran has a salary of $70,000 per year. Their current monthly bills are a car loan of $437, credit card payments of $208 and a proposed home payment, including escrow, of $1,123. There are one other criteria that needs to be met after meeting the debt to income ratio called the residual income. The residual income indicates how much money a veteran should have left after paying their debt and housing payment. The residual income amount is based on the number of people living in the home, the size of the VA mortgage and location. With these figures the lender can predict whether or not the borrower is a good risk for the loan. Cash out – this is where a borrower can take advantage of the built-up equity in the home. The loan to value ratio will be based on the borrower’s credit score and debt to income ratio. Streamline – Mortgage rates move in cycles. Some years they are up and some years they are down. When the rates drop, people with existing VA home loan can choose to refinance in order to take advantage of the better interest rate. The streamline refinance has less paperwork and is usually a much faster loan process. Refinance from other loan to VA mortgage – if an eligible veteran used a different type of mortgage to purchase their home and would like to take advantage of the VA home loan program, they are welcome to do so. The various refinance options make it easy to either keep a Florida VA loan or use a VA mortgage to remove an existing loan. With the no money down option, competitive interest rates and no private mortgage insurance, it is easy to see why eligible veterans choose the Florida VA loan as a way to purchase a home.